Set in a beautiful South Devon valley with rolling green countryside and endless skies, Brownscombe is the ultimate in get-away-from-it-all tranquillity. Watch the sunset from the sumptuous bed, or lie back in the beautiful copper bath tub, feel the air on your skin, and soak up the views from the Brownscombe cabin. 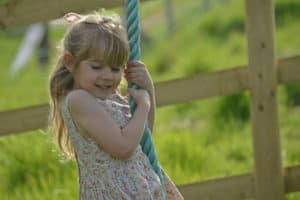 Your children will love it here… collecting eggs and helping to feed our friendly pigs, sheep, chickens and ducks. Our safari tents offer true glamping luxury with everything you need for a wonderful family holiday in the heart of Devon. Our Cornish style tabernacle is utterly endearing with its stained glass window and tiny bell tower. All the luxury of a hotel, with all the excitement and natural wonder of the great outdoors. 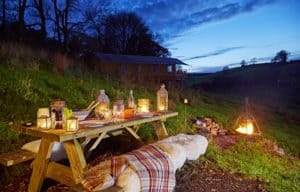 Our glamping holidays make exploring Devon easy. Idyllic surroundings, lush green pastures and unadulterated night skies offer the chance to truly unwind and escape the hustle and bustle of everyday life. 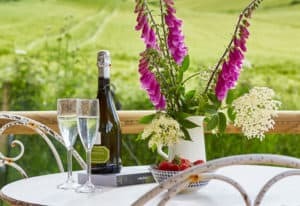 Developed on the site of our family farm in the heart of the South Hams, Brownscombe is the ultimate destination for luxury glamping in Devon. In the words of one of our guests “the comfiest beds that we have ever slept in, the best views we’ve woken up to and the kindest hosts you could wish for“, come and experience it for yourself! Our sweet tin Tabernacle is utterly endearing with its stained glass window and tiny bell tower. Cosy up with a hot chocolate in the rocking chair by the stove, or relax outside with a glass of bubbly in the wood fired hot tub. Our Cabin is also designed for romance, with its luxurious copper bath and rolling views up the valley. Our luxury safari tents are perfect for families and friends, with everything you need and more for a really relaxing stay. Wood burning stove, comfy beds, flushing loos, and hot running water… this is camping, but not as you know it. Our beautiful Brownscombe Cabin is also big enough for a family stay with a double bed and two bunks. Book all four of our safari tents for an indulgent weekend, perfect for hen dos, landmark birthdays or other special celebrations. We can cater for you in our beautiful Lodge, and you can choose from our range of group hampers and activities to create a truly memorable experience. We also offer group bookings for families in multiple tents or combining a tent with the Brownscombe Cabin.